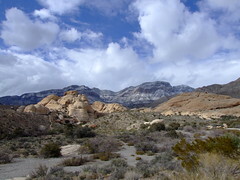 Looking across the desert at Red Rock Canyon, with mountains and rock formations rising up from the flats. It's warm down by the rocks, but there's plenty snow only a thosand or so feet further up. A beautiful, wild empty place, only a few minutes from the bright lights and bustle of the Las Vegas Strip. A welcome break from the crowds and noise.